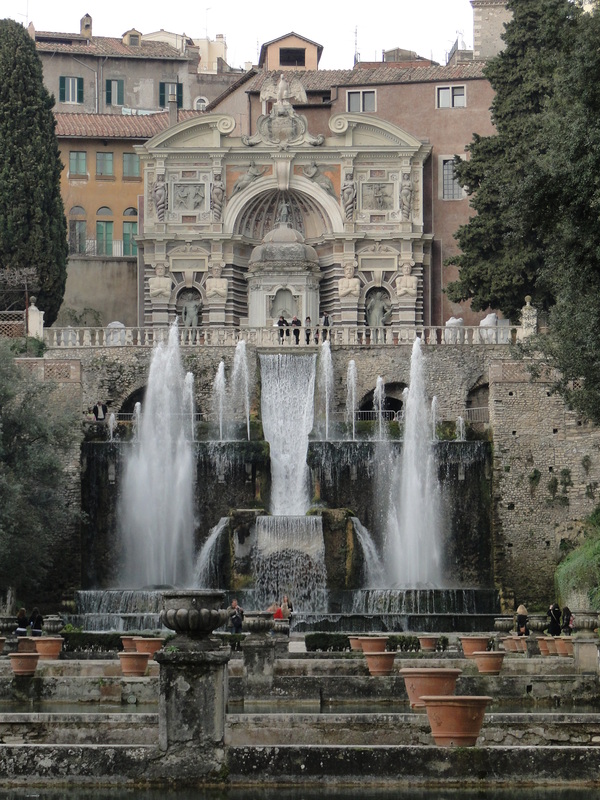 The villa d’Este in Tivoli on the outskirts of Rome is famous for its amazing 16th century terraced gardens, which on a steep hill of only about four hectares, include a multitude of fountains, grottos, sculptures, secret paths and secular trees. More than a garden, it a symphony of waterworks. 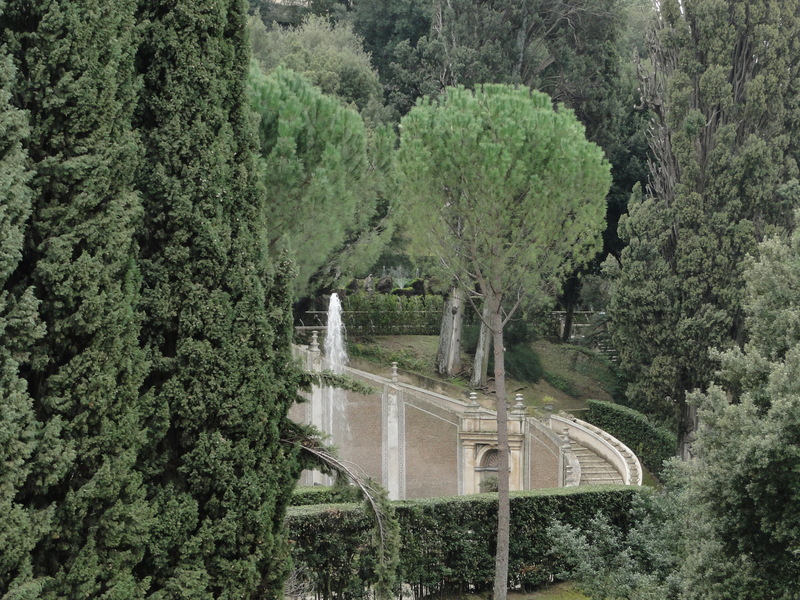 The gardens and villa were created in the mid-16th century by Ippolite II d’Este, second son of the renowned Lucretia Borgia, who had married Alfonso d’Este, Duke of Ferrara. Ippolite was destined for an ecclesiastical career and sent to Rome at an early age, where he became the richest cardinal of his time. His openly displayed ambition to become the second Pope of the family, was crushed at the 1550 conclave, where he didn’t gather enough votes to make it to the supreme throne. His grandfather was the infamous Pope Alexander VI, or Rodrigo Borgia, father of Lucretia and Cesare (Machiavelli’s model for the Prince). Instead, he was granted the governorship of Tivoli, where he gave free rein to his passion for the arts, throwing himself into the construction of a new villa and gardens. 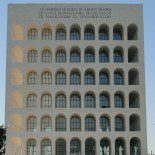 At the same time, he commissioned the restoration of the nearby Villa Adriana, or former villa of 2nd century Roman Emperor, Hadrian, which came under his jurisdiction. For his own villa, he spared no expense. Even though he was extremely wealthy, he was unable to keep his spending under control and spent his life being chased by creditors. It didn’t stop him from wanting the most impressive gardens the world had seen to date, reminiscent of the antique gardens of Babylonia. He appointed Pirro Ligorio his chief architect and archeologist, and together their made plans for an extended villa and gardens, in place of the old governor’s palace, which took them more than twenty years to complete. The dry and chalky terrain was not ideal, but the steep slope would enable a system of cascading fountains to work, and the nearby Aniene river would supply enough water to the garden. The river was consequently diverted, and an extremely sophisticated hydraulic system of pipes and reservoirs was built. The original system, although restored several times, still exists today and the excess water is still used to irrigate the surrounding agricultural fields. The villa d’Este quickly became famous throughout Italy and Europe for its magnificent gardens, which were considered as the masterpiece of Italian-style gardens. As was fashionable at the time, mythological figures out of Ovid’s metamorphosis were used to ornate the hundreds of fountains, grottos and alleyways, and celebrate the glory of the Este family. One of the most famous is the fountain of the Organ, which still plays music at regular intervals from an hydraulic organ. After Ippolite’s death in 1572, the villa stayed in the Este family until the end of the 17th century, when they slowly abandoned it because of its overbearing maintenance costs. The sculptures were gradually taken out to decorate other palaces or villas and the garden overgrown. 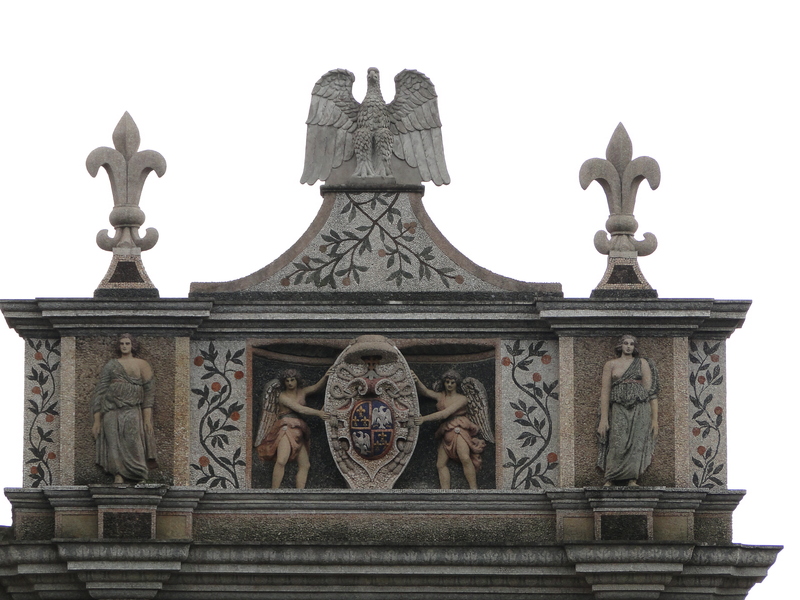 A century later, its ownership was transferred to the Hapsburg-d’Este family, a branch created when the last female descendant of the Este family, Mary Beatrice, married the archduke Ferdinand of Austria. However, it is only in the second half of the 19th century that the villa d’Este returned to its former glory, when a member of the German aristocracy, Cardinal Gustav von Hohenlohe, decided to lease the villa and restore it. It once again became a cultural centre, gathering writers, artists and musicians. The composer Franz Liszt famously stayed at the Villa several times between 1865 and 1885, where he wrote “Les jeux d’eau à la villa d’Este” and “the Cypress trees”. The first world war brought an end to the powerful European aristocracy and their way of life, and the estate became property of the Italian State. This entry was posted on March 7, 2011 by Salambo in Arts and culture, English, palaces, Renaissance Rome, Travel outside Rome and tagged Alexander VI, Hapsburg-Este, Ippolite d'Este, Liszt, Lucretia Borgia, Roma, Rome, Tivoli, villa Adriana, Villa d'Este, waterworks.